These measure tapes are great custom promotional items. Clients and potential customers love them. They are sturdy for everyday light usage. The key chains I ordered less than one week ahead of the party, were a huge hit! They arrived a day early and people loved them. Wide variety of gifts, price ranges and easy personalization! Thank you! Ordered these to give out at Church on Father's Day. A practical way of honoring our Father's with a small token of appreciation. They seem to be exceptionally made. Very reasonably priced. Thank you so much. We received the key chains and they are exactly as the picture shows. Great item for your buck! orders these for wedding thank you bags. they are well made and very practical. Love, love, love these. If I'm going to spend money on a favor I want something practical. Who hasn't been in a store and need a slight measurement? Quality product to carry in your purse or on your key ring. Adorable! with the baby in a baby carriage sticker and easy to put together. Arrived so quick! We got them as wedding favors and everyone absolutely loved them!! The only downside was we had to sticker all 80 of them and the text was a little hard to read. All in all totally worth it! Got these for favors for a jack and jill shower. They were a hit! Great quality perfect size. 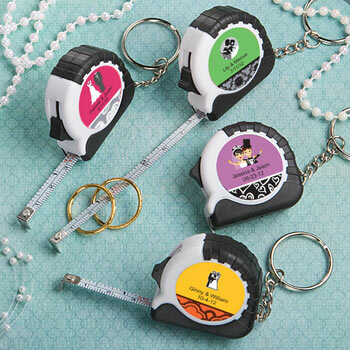 The measuring tape keychains were just what I was looking for! Everyone loved their favor! I would buy these again. I ordered these party favors for our wedding. I placed the order and they came in pretty quick. They were super cute, and everyone loved them. I'm very pleased with the tape measures. I ordered 80 of those to put in gift bags for the elementary school staff where my children and grandchildren went. To be quite honest the quality of these small measuring tapes was better than what I expected. I hope all of the guests will enjoy them! Used for my team for my direct sales business.